The Ink Factory has bought film and television rights to Un Su Kim's The Plotters. The independent studio is behind Susanne Bier's The Night Manager, Chan-wook Park's The Little Drummer Girl and Stephen Merchant's Fighting with My Family. 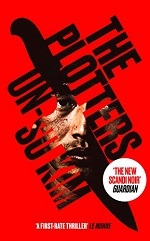 The Plotters was recently published by 4th Estate in the UK and Doubleday in the US and has been dubbed 'Kill Bill meets Murakami' by author DB John. It has sold in 25 countries to date and was a Spiegel bestseller in Germany, where it was published last autumn. The deal was negotiated by Yogita Puri on behalf of The Ink Factory and Emily Hayward Whitlock of the Artists Partnership on behalf of Barbara J Zitwer Agency and KL Management, who are the international agents of Un Su Kim, for whom this is the first English language film deal. The Ink Factory's LA team, led by Stephen Cornwell, will develop the project, with Michele Wolkoff as creative lead. Simon Cornwell and Stephen Cornwell, co-CEOs of The Ink Factory, said: "Un Su Kim has produced a witty noir thriller that subverts expectations at every turn, probing the insidiousness of unaccountable institutions and the consequence of corruption in a completely enthralling and original tale. A fresh take on the machinations of the criminal underworld, the universe of The Plotters cries out to be explored cinematically." Wolkoff said: "From the moment I started reading The Plotters, I knew there was nothing else like it. With such an original and distinct voice - equally funny, heartfelt, yet brutally dark - Un Su Kim takes the popular assassin genre and uses it to critique society, placing a subtle mirror to our world today. At the heart of the story audiences will find fantastic female characters looking to change the world...what's not to love!"